Denne nydelige hytta ligger på 1,6 mål stor tomt rett ved vannet. Her kan ungene holde på hele dagen med lek og vannaktiviteter utfra egen brygge med en liten sandstrand. Vannet er over 4 mil langt med flotte forhold for kajakk og fiske (her kan man få både ørret og tryte). We stayed at the house for a week in August. We found the house spacious, the kitchen very well equipped, the bedrooms cozy with plenty of space to leave our things. The two extensive porches are perfect to simply sit and relax or have a meal. The house being surrounded by wood gave our two children plenty of opportunity to explore wildlife, make crafts from twigs, wood and bark they found around the house. The berries they picked were very welcome. Being on an island in the middle of a lake gave us plenty of opportunity to make use of the boats that come with the house. We enjoyed going out several times a day exploring the lake and going to smaller islands to take a dip. We would definitely return if we got the chance. We are so pleased to hear that you enjoyed your stay! The place is perfect for kids of all ages that love outdoor activities :-) combined with the comfort of a modern home. Een geweldig huis op een geweldige locatie. Het hele huis is zeer ruim en licht. Zeer complete inrichting. Communicatie met eigenaar is zeer goed en zeer behulpzaam. Wij waren met 6 personen, meer dan voldoende woonruimte en tuimmeubilair. Aanrader als je houdt van natuur, varen, vissen, kanoën, zwemmen. De boten die bij de huur zijn inbegrepen zijn van goede kwaliteit (geen loze beloftes) De jaccuzi is een echte aanrader. Kortom; geweldig. A fantastic house on a fantastic location. The house is very clean, spacious and light. Communication with owner was very good and if needed he offered help and send very good information on forehand. the boats where of good quality and the jaccuzi is fantastic. If you like natur, fishing, boating, swimming this is the perfect spot. We are so deligthed that you share our love for the house and location. We always want to serve to our best effort. Großzügig geschnittenes Haus mit einem Traumausblick und allem ausgestattet was man braucht. Hier gibt es Ruhe und Erholung pur! Wir haben uns sehr wohl gefühlt. Der See direkt vor dem Haus lädt zum Angeln und Boot fahren ein. Das Baden stellt sich wegen dem weichen Boden etwas schwierig dar, aber in der Nähe gibt es eine schöne Badestelle die man nutzen kann. Das Haus ist mit allen Grundbedarfsmitteln ausgestattet. Sehr empfehlenswert! Spent our summer vacation here. Very quiet and peaceful place. Exactly what we were looking for. The house is brilliant. Equipped with everything you need. The combo of the house, the boats, the lake and the fact that we had 14d of sunshine made this a perfect holiday. Thank you for this wonderful week, we enjoyed it very much! The whole house has a very high standard, we found everything we needed. And the spot is just great! 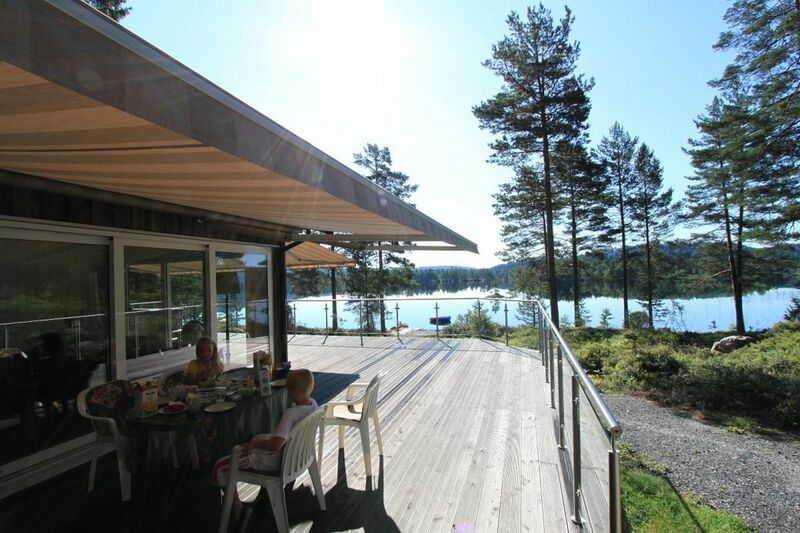 Getting up in the mornings, overlooking the peaceful lake, having breakfast in the sun, canoeing, kayaking or trying to catch a fish, swimming and picking blueberries, barbecueing at a never ending sunset, drinking wine at the fireplace-just like paradise! !